Sorry... the 2017 GMC Sierra 3500HD is no longer being sold as new. Instead, take the first step to a great deal on 2019 GMC Sierra 3500HD with a free price quote! 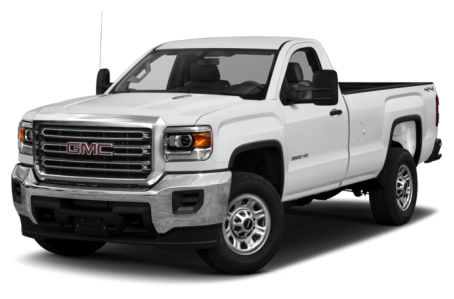 The 2017 GMC Sierra 3500HD is a heavy-duty, full-size pickup truck with a maximum payload/towing capacity of 7,153/22,900 pounds. It is offered in regular, double, or crew cab body styles, and in regular or long bed lengths (regular cab models only come in the long bed). It competes with the Ford F-350 and RAM 3500. Four trim levels are available: the base model, SLE, SLT, and Denali. Sharing the same platform as the Chevrolet Silverado, the Sierra 3500HD has a rugged appearance with its squared-off, blockish forms. The front-end features an exposed metal front bumper, oversized grille, and rectangular headlight clusters. Standard corner-step bumpers and optional EZ Lift-and-Lower tailgates make loading and unloading convenient. An optional Gooseneck/5th Wheel Trailer Prep Package with a spray-in bedliner allows the Sierra 3500HD to tow larger trailers. The Sierra 3500HD comes with a standard 360-hp, 6.0-liter V-8 engine that produces 380 pounds-feet of torque. A more powerful 397-hp, turbo-diesel 6.6-liter V-8 is also available. Both engines are mated to a 6-speed automatic transmission and two-wheel drive (2WD). Four-wheel drive (4WD) is also optional for all models. Inside, the Sierra 3500HD has a standard cloth interior with a 40/20/40 front bench seat and 60/40 split-folding rear seat. The center stack features a standard audio system with 4.2-inch color display, USB ports, and auxiliary jack. It can be upgraded to the IntelliLink multimedia system with an 8-inch touchscreen, Apple CarPlay/Android Auto capability, Bluetooth connectivity for phone and audio, OnStar 4G LTE connectivity with Wi-Fi hotspot (subscription required), and a Bose premium audio system. Air conditioning, power locks, and cruise control come standard. Available features include leather upholstery, dual-zone automatic climate control, power windows, heated/ventilated seating, a wireless phone charging station, remote keyless entry, and remote vehicle start. Standard safety features include front, side-impact, and side curtain airbags, all-disc antilock brakes, an electronic stability control, and a tire pressure monitoring system. Digital Steering Assist is a new option that offers enhanced steering, stability, and road-holding on rough terrain. A backup camera, a lane departure warning, an electronic trailer sway control, and a hill start assist are available as well. 5 of 5 (100%) consumers said they would recommend this vehicle to a friend.